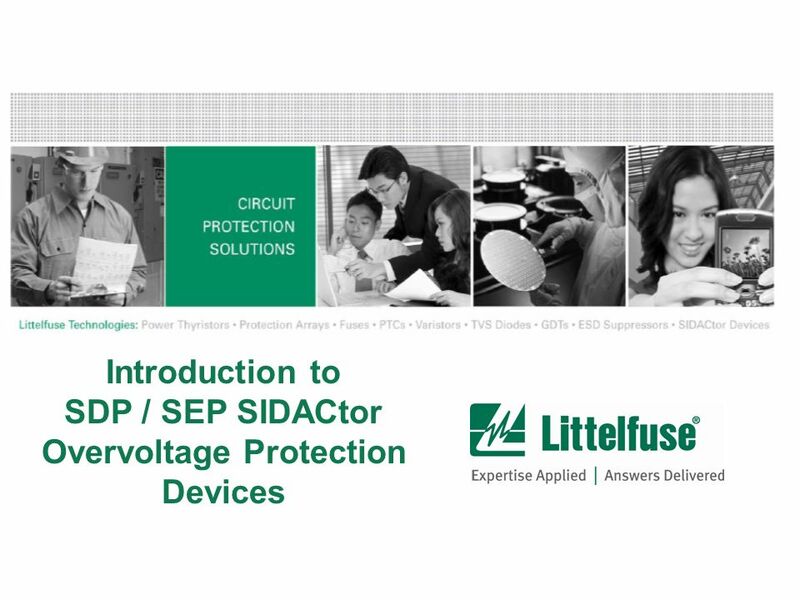 This module will introduce you to the Littelfuse family of SDP and SEP SIDACtor overvoltage protection devices. The estimated time to complete this module is 10 minutes. 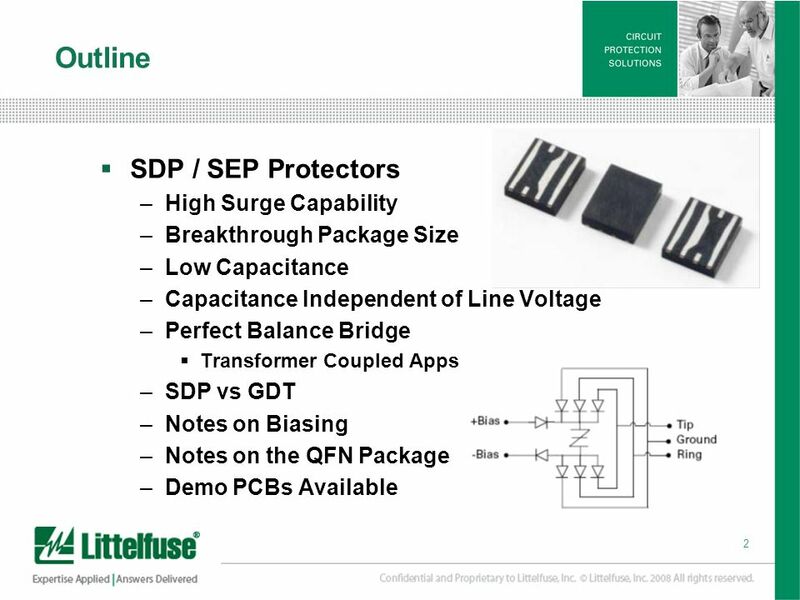 Breakthrough Package Size Low Capacitance Capacitance Independent of Line Voltage Perfect Balance Bridge Transformer Coupled Apps SDP vs GDT Notes on Biasing Notes on the QFN Package Demo PCBs Available In this module we will first focus on the key features and benefits of the new SDP and S-E-P Protectors for broadband protection from Littelfuse. 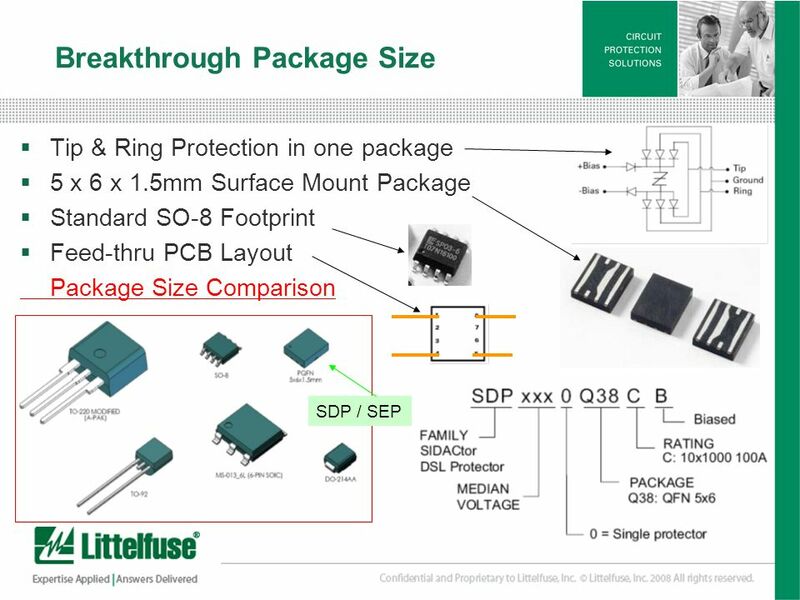 These will include the high surge capability, the breakthrough package size and the low and uniquely constant capacitance of these exciting new offerings. We will take a few minutes to dive into some detail on the benefits of the perfectly balanced bridge circuit and compare the SDP to Gas Discharge Tubes. We will wrap it up with few comments on the biasing circuit and a look at the package details. Finally, we will discuss the demo p c boards available for customer evaluation and qualification. Lets get started with some features and benefits. 5 Broadband Overview Broadband encompasses many technologies and protocols. For this module we will be focusing on the xDSL technololgies. 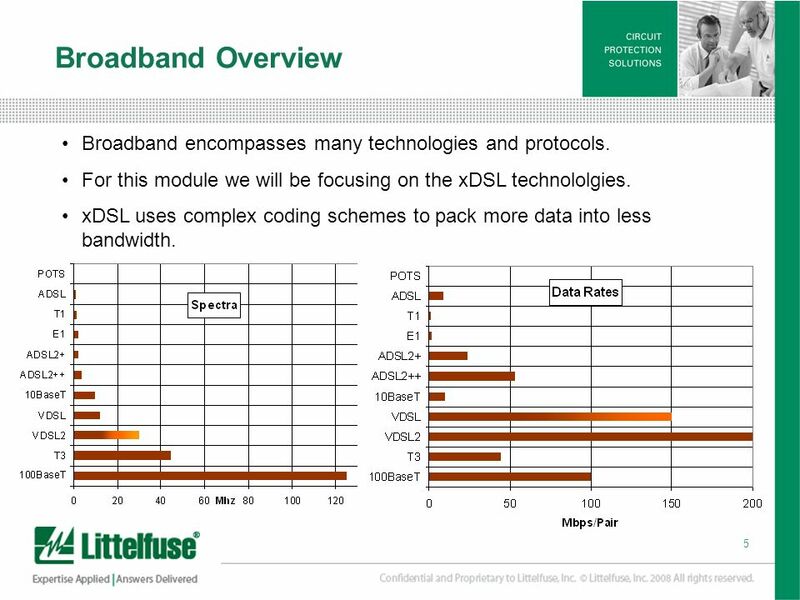 xDSL uses complex coding schemes to pack more data into less bandwidth. Broadband encompasses many technologies and protocols. The most popular ones are shown in the two charts here. The chart on the left shows the spectral content of the various types of signals. They range from ADSL, which is a one point one megahertz signal to 100 base T Ethernet which uses a 125 megahertz clock. But the clock speeds can be deceiving. The chart on the right shows the protocols in the same order, but now instead of the spectra we are looking at the data rates present on each pair of the protocols. You can see that the DSL signals have much more data in them. This is because the complex DSL coding schemes pack a lot more information in each clock cycle than the simpler T1 E1 or Ethernet coding schemes. These complex coding schemes also present a challenge to the protection products used on the data lines which we will soon see. Low Capacitance High Capacitance will rob power from the signal. Capacitance gains in importance as the data rate of the signal increases. Non-Issue for Voice, T1/E1 Minor Issue for T3, ADSL Major Issue for VDSL, Ethernet SDP & SEP devices have capacitance values that are low enough to preserve signal power. Typical Capacitance Values (Zero Line Voltage) SDPxxx0Q38CB VBIAS = 50V 11 pF SDPxxx0Q38B 23 pF SEPxxx0Q38CB VBIAS = 5V 20 pF SP03-3.3 9 pF P0080SCMC 73 pF P0640SCMC 93 pF P1800SCMC 57 pF P3100SCMC 50 pF GDT <1 pF The SDP and S-E-P protectors offer low capacitance to the broadband signal. This is key because high capacitance will rob power from the signal, limiting bandwidth of the signal or the distance the signal can be transmitted or both. 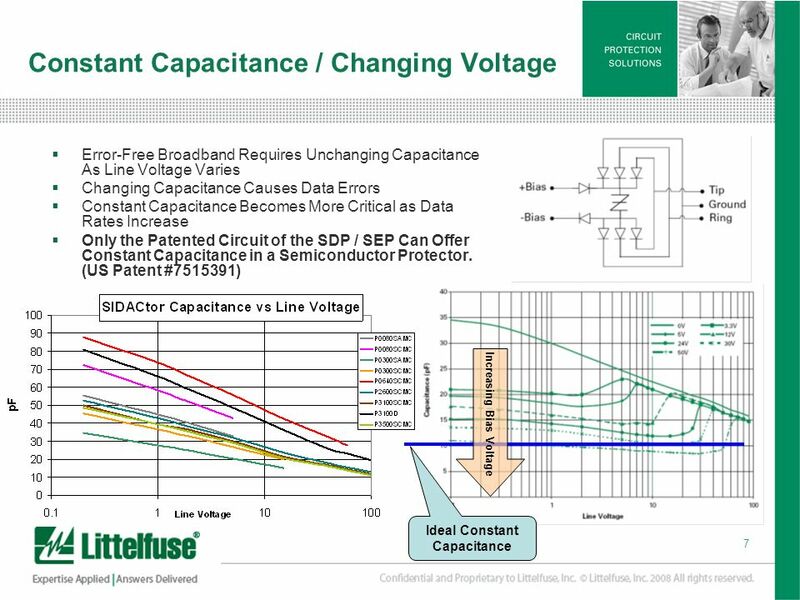 The effect of high capacitance becomes a larger and larger issue as the data rate increases. It is not a real issue for voice or T1-E1 signals and is only a minor concern for T3 and the early ADSL technologies. But it is a major issue for VDSL and Ethernet applications. In the table you can see the nominal capacitance loads of several protection devices. 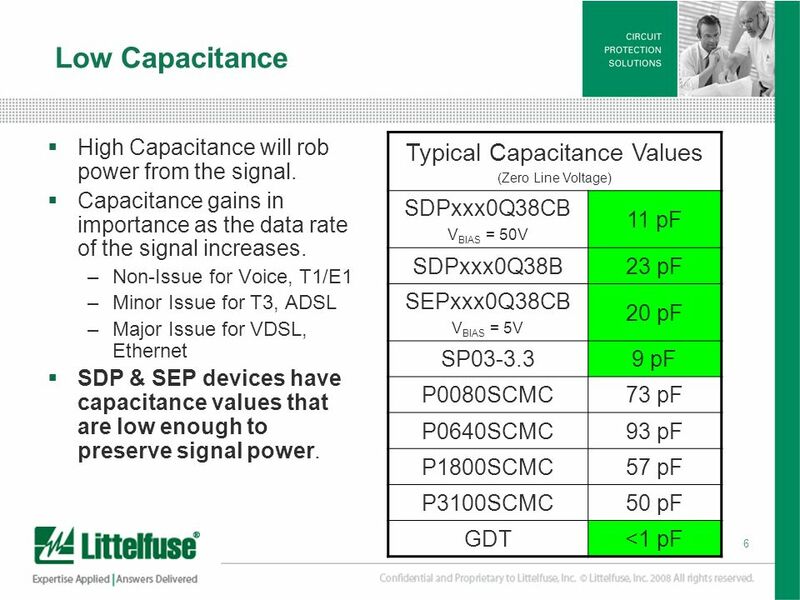 The devices with acceptably low capacitance for broadband signals are highlighted in green. Note that even the micro capacitance line of SIDACtor devices do not make the cut. The SP-O-3 series is low capacitance, but cannot meet the high surge requirments. Gas Discharge Tubes have very low capacitance, but cannot offer the protection performance of semiconductor devices. One Robust SIDACtor Device One VS (T-R, T-G, R-G) Optimal Capacitance Balance to Ground Minimal Longitudinal Conversion Loss No Conversion of Common-Mode Events to Differential Mode It is worth looking at the unique patented circuit used in the SDP and S-E-P protectors. The device is actually built from three silicon chips. The SIDACtor element in the middle of the bridge is rated to handle simultaneous surges from the tip and ring lines. This means that the SIDACtor in the Q38CB versions, which are rated for 500 amp 2 by 10 surges can actually handle more than 1000 amps. The two other chips are diode chips. One is divided up to create four common cathode diodes as shown on the top of the diagram. The other is divided up to create four common anode diodes as shown on the bottom of the bridge. Each of the four diodes are sized to handle the current requirements of each position in the bridge. Because these diodes are all perfectly matched to each other, the bridge is perfectly balanced and symmetric. Because there is a single SIDACtor device in the bridge, the protection voltage is exactly the same between any two pins. While the circuit analysis is beyond the scope of this module, the bridge minimizes the difference between tip and ring to ground capacitance and tip to ring capacitance. This minimizes another type of distortion on the broadband signal called longitudinal conversion loss. The bridge also prevents the conversion of common mode events to differential mode. This important feature is worth a closer examination. No Conversion of Common-Mode Events to Differential Mode 2-Element Solution OVP Switches Close when VBO is present. 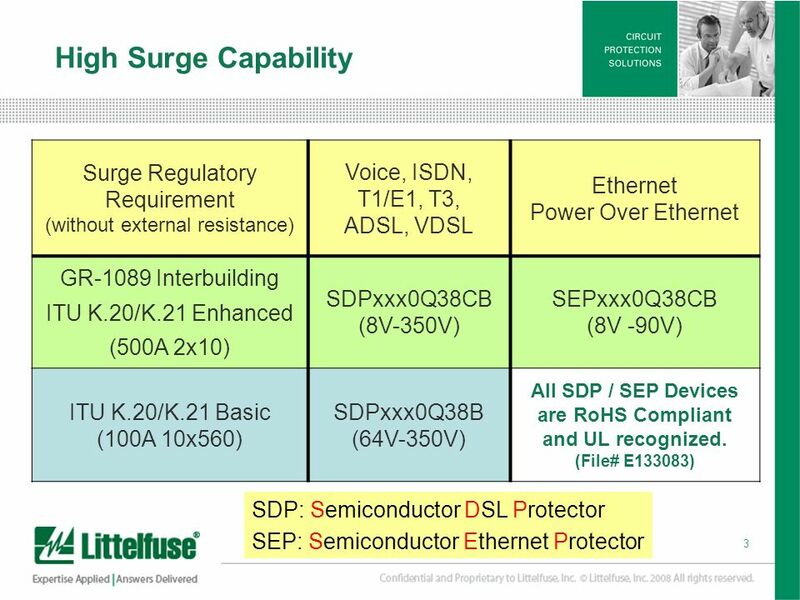 3-Element Solution Here are three diagrams that show a common mode surge applied to various protection schemes on a DSL interface. All DSL interfaces use a coupling transformer as do all Ethernet, T3 and T1-E1 circuits. Whenever an interface uses a coupling transformer there is a danger that common mode surges will be converted to differential mode by the protection scheme. This is a problem because while transformers will not couple very much energy to the driver circuits during a common mode surge, they will couple the maximum amount of energy during a differential mode surge. The first circuit shows simple tip to ground and ring to ground protection. This could be semiconductor or GD tease. Both are essentially voltage activated switches. In this example, the breakdown voltages of the two devices are not perfectly matched. In reality, they never would be either. As the surge voltage increases, the upper switch, which is activated at 300 volts will close first and the current represented by the blue arrow will circulate. However, since the upper switch is closed, the purple current will also begin to circulate. In fact, the lower switch may never close since the voltage may never reach 310 volts. Two bad things happen in this scenario. First, the upper switch is probably only rated for the blue current and adding in the purple current may destroy the upper protector. The second bad thing that happens the purple current flows through the windings of the transformer, coupling the maximum amount of energy into the driver side of the transformer. This is shown by the red arrow and this current presents a real threat to the driver circuitry. The second circuit shows an improvement to the first circuit. Here, three protection devices that operate at half the voltage of the first circuit are used in a wye arrangement. This represents a wye configured SIDACtor arrangement or a three element gas tube arrangement. Lets look at what happens in this circuit during a common mode surge. As the voltage reaches 300 volts, the top and center switches will close and, again, the blue current will circulate as designed. This time, however, since the center switch is closed, the lower protector is now grounded at its upper terminal. This means that the 300 volts is now across the 160 volt switch, forcing it to close. However, this takes a few micro seconds to occur. During that time the purple current will still be drawn through the transformer winding. Fortunately, this time the current only exists for a micro second or two until the lower switch closes, meaning much less energy is coupled through to the sensitive driver circuitry. The bottom diagram shows what happens when an SDP device is used. Here there is only one SIDACtor and so there is only one voltage controlled switch. When it closes the diodes will conduct in perfect tandem to take both the tip and ring lines to ground simultaneously and virtually no current will circulate in the transformer meaning almost no energy will get coupled into the driver circuits. 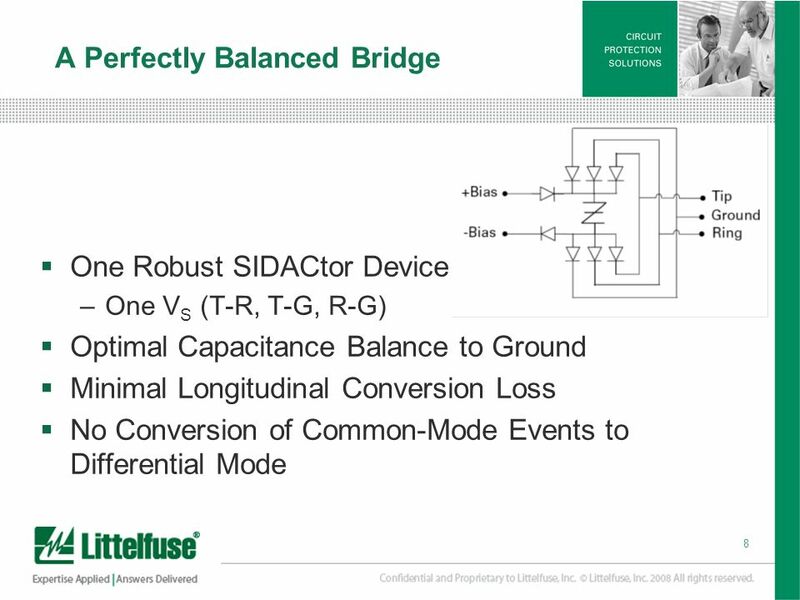 While shown for DSL here, this perfectly balance bridge advantage is useful in any transformer coupled application. 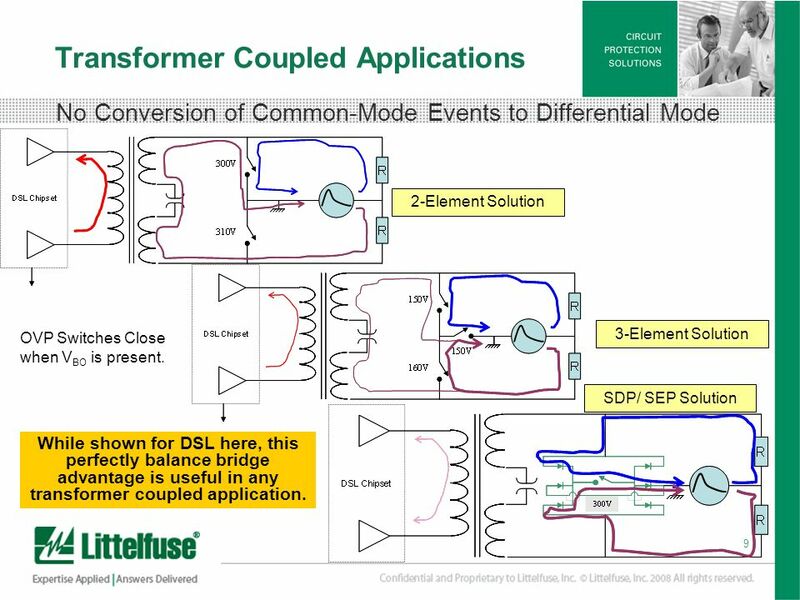 SDP/ SEP Solution While shown for DSL here, this perfectly balance bridge advantage is useful in any transformer coupled application. Acceptable Capacitance Yes Constant Capacitance AC Power Cross Dissipation Very Low Very High Low (< 75V) Breakover Voltages Available No Voltage Overshoot Board Space Req’d Minimal Substantial Backside PCB Mount Not Likely After Some customers are considering the use of gas discharge tubes for broadband protection. For those customers that are determined to use Gas discharge tubes, they certainly can purchase them from Littelfuse. However, a direct comparison of the GDT with the SDp is warranted. While both have acceptable capacitance and constant capacitance, the SDP device has significant advantages during AC power cross events. This is because in their on state, GDT’s have an on-state voltages of 20 to 30 volts. In comparison silicon solutions have on-state voltages of 2 or 3 volts. This means that during the GR point 2 Amp tests, the power dissipation by a GDT will be about 55 Watts compared with the power dissipation by silicon solutions will be about 6 watts. 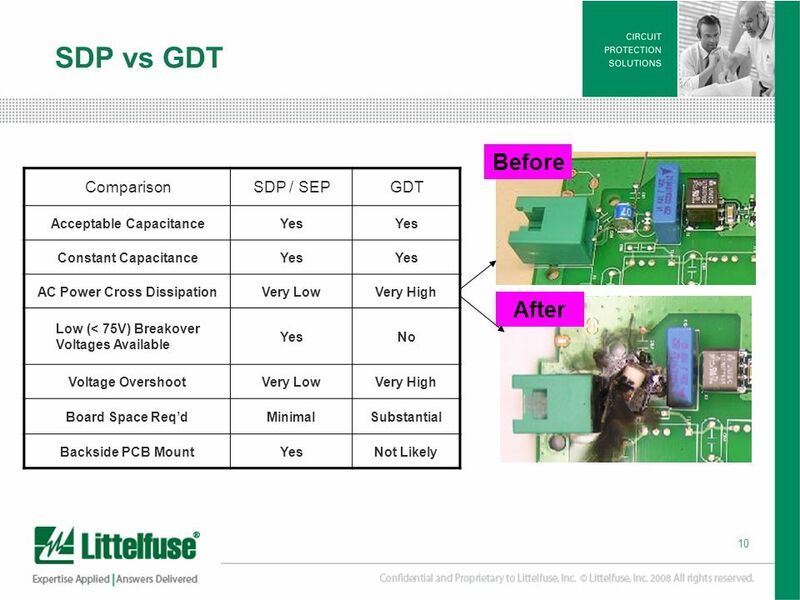 Since the GDT power is about ten times more than the silicon power, GDT devices will generate very high temperatures that can damage PCB’s and surrounding components. Using an SDP device in conjunction with the Enhanced TeleLink fuse can limit damage by opening during the 2.2 Amp tests in 5 minutes or less with no damage to the SDP, the PC board or surrounding components. For Ethernet applications, there really is no GDT solution since they are not offered with a breakdown voltage below about 75 volts. Also, the voltage overshoot of GDT devices is much higher that that of silicon solutions. This is especially true for the lowest voltage GDT devices. When we compare the board space requirements, we find that, while there are some fairly small surface mount GDT devices available, they must have considerable empty board space around them to prevent issues during the AC power cross tests. Finally, with a package height of only one and a half milly meters, the SDP and S-E-P devices can be placed on the back side of almost any PC board. GDT devices almost always must take up valuable top side PC board real estate. The bias voltage MUST be less than the SDP / SEP stand-off voltage. (Vbias < Vdrm) The bias supply may be ground referenced. The bias supply may “float” with respect to ground. The higher the bias supply voltage, the better the performance of the SDP / SEP. Just watch out for Rule #1… We recommend 1 MΩ resistors for most applications. The bias supply isolation resistors must be voltage rated to VS to avoid flash-over during a surge event. (Usually 1206 for SDP or 0805 for SEP) Several devices can share bias resistors. Bias supply current will be < 5µA if these rules are followed. Even though the biased bridge presents a breakthrough in performance, many designers will not be familiar with their use and will have questions about biasing the Q38CB versions of the SDP and S-E-P devices. Let’s look at seven simple rules for biasing. First, the bias voltage must be less that the V-D-R-M of the device being used. This prevents the bias supply from triggering the SIDACtor device into conduction. Rules two and three note that the bias supply can be ground referenced, but doesn’t have to be. The bias voltage cannot ever get to the tip and ring lines because the diode arrangement prevents any current flow. Rule four states that the higher the bias supply voltage, the better. This is because higher bias voltages will further depress the capacitance presented to the broadband circuit. Rule five states that we recommend that a minimum one megohm resistor be placed in each bias supply line for isolation in most applications. Rule six notes that the bias resistors should be voltage rated for the V-S to avoid any flash over during a surge event. For most SDP applications this means a 12-O-6 size resistor is a minimum size and for Ethernet applications, the resistor must be at least an O-8-O-5 size. 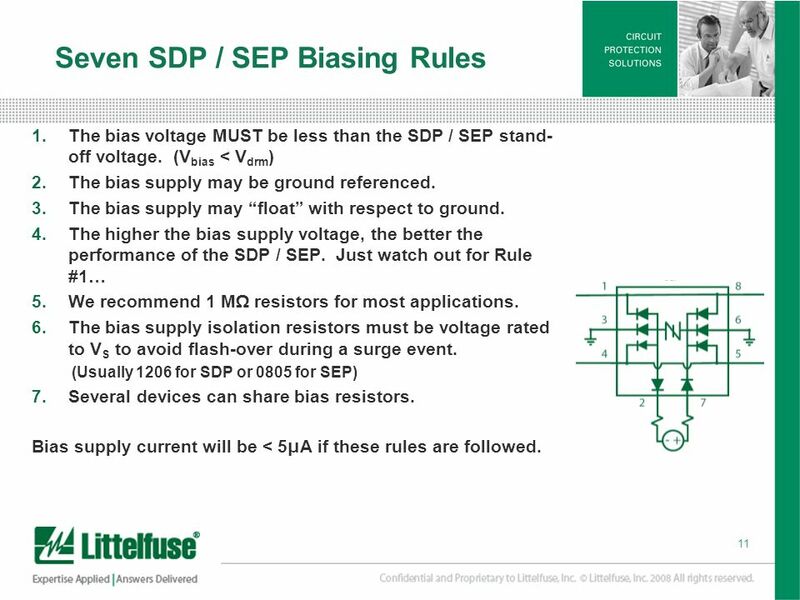 Rule seven says that several SDP or S-E-P devices can be biased from a single pair of resistors. 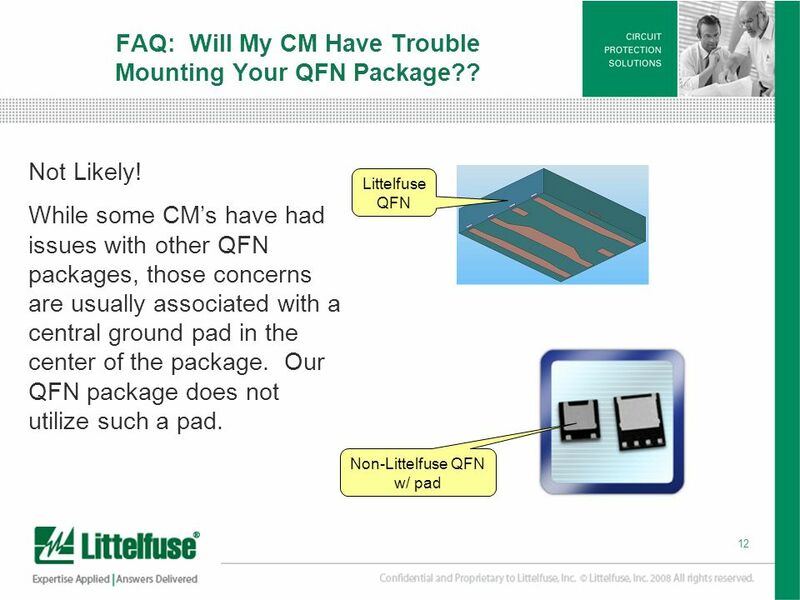 12 FAQ: Will My CM Have Trouble Mounting Your QFN Package?? 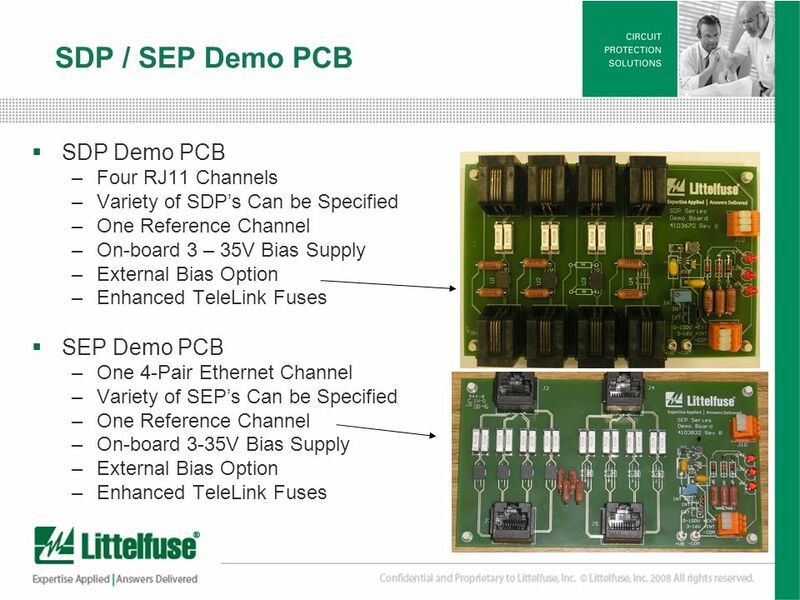 Variety of SDP’s Can be Specified One Reference Channel On-board 3 – 35V Bias Supply External Bias Option Enhanced TeleLink Fuses SEP Demo PCB One 4-Pair Ethernet Channel Variety of SEP’s Can be Specified On-board 3-35V Bias Supply To help customers get familiar and more comfortable with this revolutionary technology, a couple of demo PC boards have been developed for the customers use. The SDP version has four RJ-11 channels. Each of the channels can use a different SDP device, but we recommend that one channel not contain an SDP device at all so that is can be used as a reference channel. This reference channel allows the customers to separate the impact of the SDP on the circuit from the interference caused by the exact board layout and other connector issues that may impact the signal, but not be representative of their own circuit. There is an on board bias supply that can provide an adjustable three to thirty five volts of bias. Or the customer can connect their own external bias supply as well. Each channel is has Enhanced TeleLink overcurrent protection. Full documentation and instructions are included with each demo board. For Ethernet customers, the RJ45 Ethernet Demo PCB is equipped with RJ45 jacks so that it can be simply and quickly inserted into the customer’s interface. SEP devices provide the overvoltage protection. It can be ordered with any of the SEP devices installed. Also, Enhanced TeleLink fuses provide overcurrent protection. There are two identical protection circuits on the board. As you can see in the photo, the circuits on the left side have SEP devices installed but the circuits on the right side do not have the SEP devices installed. This is intentional as it allows the customer to compare the performance of the two circuits. The difference will be the effect of the SEP device on the performance. This allows customers to ignore the effects of the “loop-through” connections and focus only on the effects of the SEP itself. The board is equipped with its own on-board bias supply. The customer is also able to provide their own bias, if desired. Full documentation and instructions for the demo board are available. Thank You! Thank you. 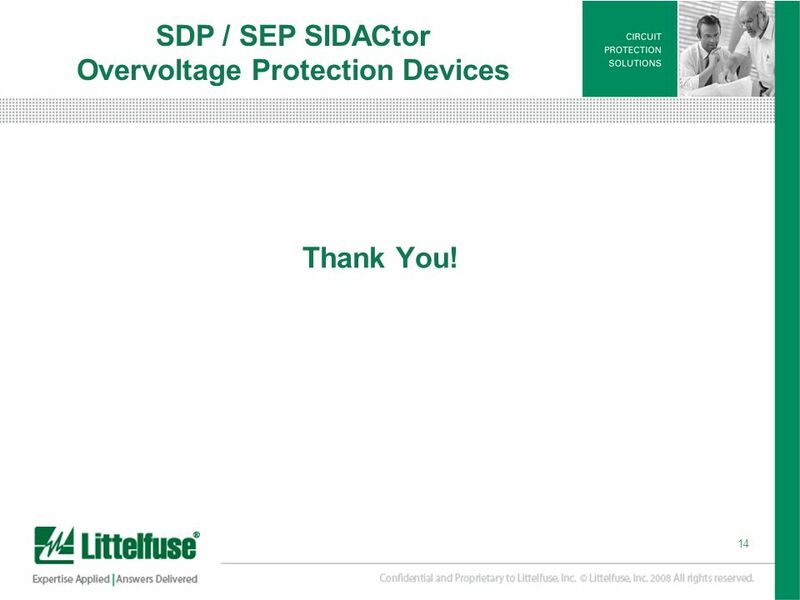 This completes the Introduction to the SDP and SEP SIDACtor overvoltage Protection Devices module. Download ppt "Introduction to SDP / SEP SIDACtor Overvoltage Protection Devices"
Automation and Drives SIRIUS SC Solidstate Switching DevicesA&D CD CC PM4, Jan. 21, Gliederungspunkt 10 Gliederungspunkt 1 Gliederungspunkt 2 Gliederungspunkt. Electrónica de Potência © 2008 José Bastos Chapter 2 Power Semiconductor Switches: An Overview 2-1 Chapter 2 Overview of Power Semiconductor Devices Introduction. April 4 AP Physics. In: How much energy is dissipated as heat in 20 s by a 100 Ω resistor that carries a current of 0.5 A? a)50 j b)100 j c)250 j d)500. © 2006 ITT Educational Services Inc. IT412 Voice and Data Integration : Unit 2 Slide 1 Unit 2 Modulation and Transmission Schemes.